Deep lobe parotid tumors which are located deep to the facial nerve are rare. If you have a deep lobe tumor make sure your surgeon has extensive experience treating these tumors. The “deep lobe” of the parotid gland makes up a variable amount of salivary gland tissue lying deep to the facial nerve. Approximately 10% of parotid tumors arise from the “deep lobe”, with a small proportion of these developing extensions around the jaw bone and into the deep spaces of the neck lying adjacent to the pharynx or throat. When deep lobe tumors extend beyond the confines of the parotid capsule, they encroach on other important neck structures beyond the facial nerve. These important structures may include the carotid artery, jugular vein, lingual nerve, vagus nerve, and glossopharyngeal nerve. Because of the complexity of structures in and around the space occupied by the tumor, these cases present a greater surgical challenge. Dr. Osborne has extensive experience treating superficial and deep lobe parotid tumors. Diagnosis of deep lobe tumors may be elusive because of their hidden location. A 31-year-old man presented with an oral mass that had become progressively larger over the previous several months. He denied any odynophagia, dysphagia, otalgia, weight loss, or respiratory distress. On intraoral examination, the patient was noted to have a left-sided submucosal mass that involved the left oropharynx (figure 1). On nasal endoscopy, submucosal fullness was seen in the left nasopharynx; on laryngoscopy, the left oropharyngeal fullness was seen extending to the hypopharynx. However, the true vocal folds were mobile bilaterally, and the airway remained patent. 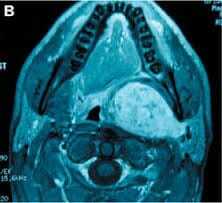 Magnetic resonance imaging (MRI) of the neck revealed a left-sided 6.8-cm parapharyngeal space (PPS) mass (figure 2). No fat tissue plane was seen between the deep lobe of the left parotid gland and the mass. Radiographically, this finding was consistent with the presence of a deep-lobe parotid tumor. with the deep lobe of the parotid. The patient underwent excision of the mass via a trans-parotid/transcervical approach (figure 3, A). The facial nerve was identified and preserved (figure 3, B), and the tumor was removed without the need for mandibulotomy (figure 3, C). The patient tolerated the procedure well, and he recovered uneventfully. Findings on histologic evaluation were consistent with a pleomorphic adenoma. A: Photo shows the planned incision for the transparotid/transcervical procedure. B: The facial nerve (arrow) is identified and preserved. C: The surgical defect (long arrow) is seen following removal of the tumor. Note the course of the carotid artery (short arrow). Neoplasms of salivary gland origin are located in the prestyloid space. They may arise from the deep lobe of the parotid gland, from ectopic salivary rests, or from the minor salivary glands of the lateral pharyngeal wall. The most common prestyloid PPS lesion is pleomorphic adenoma. The risk of recurrence for a pleomorphic adenoma is lower when it occurs in the PPS than when it occurs as a primary parotid tumor. Other benign salivary lesions may develop in the prestyloid PPS, as can malignant salivary lesions. Carcinoma ex pleomorphic adenoma and adenoid cystic carcinoma are the most frequently reported salivary malignancies of the PPS. Most schwannomas in the PPS arise from the vagus nerve and the sympathetic chain. Paragangliomas are benign, highly vascular neoplasms that arise from the paraganglia or extra-adrenal neural crest tissue. In the poststyloid space, they are associated with the carotid body, the jugular bulb, or the vagus nerve. Malignant neurogenic lesions include malignant paragangliomas and neurofibrosarcomas. Computed tomography (CT) or MRI can delineate the size and location of a PPS mass, whether it be in the prestyloid or poststyloid space. These modalities can also demonstrate whether a mass is in continuity with the deep lobe of the parotid gland. With regard to PPS tumors, these two imaging studies differ in that CT has the ability to detect bony invasion in malignant tumors, while MRI has the ability to provide greater soft-tissue resolution and to identify intracranial involvement. If increased vascularity of a mass is seen on CT or MRI, angiography is warranted. Biopsy of a PPS mass is usually not necessary; in fact, it may be dangerous prior to imaging because the degree of tumor vascularity and a tumor’s proximity to major vessels is not known. Imaging studies alone can provide a presumptive diagnosis. Surgical resection is the treatment of choice. From the Osborne Head and Neck Institute, Los Angeles. Thawley SE, Panje WR, Batsakis JG, Lindberg RD, eds. Comprehensive Management of Head and Neck Tumors. 2nd ed. Philadelphia:W.B. Saunders; 1999. Cummings CW, Flint PW, Harker LA, et al, eds. Cummings’ Otolaryngology–Head and Neck Surgery. 4th ed. Philadelphia:Elsevier Mosby; 2005. Will my jaw bone need to be split to remove my tumor? No, Dr. Osborne has perfected techniques that do not require splitting the jaw bone. This significantly reduces post-operative recovery time and pain. If you think you may have a deep lobe parotid, please call us to speak with Dr. Osborne and discuss treatment of this rare tumor.